People who write food blogs feel a fair bit of pressure to keep coming up with great food, photographing it, and sharing the recipes day after day. Perhaps that’s why on the weekends a number of us let our hair down and blog about something just for fun. Over at Eat Stuff, there is Weekend Cat Blogging, and at Sweetnicks, there is Weekend Dog Blogging. Here at Kalyn’s Kitchen I don’t have a dog or a cat, so on the weekends I write about plants. Weekend Herb Blogging is an event that started as a joke and has turned into a very fun way for bloggers to share information about interesting herbs, plants, vegetables, and flowers. The quality of the herb posts that come to me every weekend are amazing. I’m going to remind you about this weekend’s herb blogging opportunity by sharing a post from last week which I mistakenly left out after Blogger mangled my recap and I had to recreate it. From Malaysia, a great blog called Tham Jiak featured a fascinating post about curry leaves. Hop on over and check it out and you can get a taste of the kinds of things you will see this weekend. If you’re a food blogger and would like to participate, there are really no rules. Simply write about and photograph any herb, plant, vegetable, or flower sometime over the weekend. Then by Sunday afternoon (Utah time), send your link to Kalyn (kalynskitchen (at) comcast (dot) net). If you use Technorati, tag your post “Weekend Herb Blogging” and it will help others to find it, but that’s optional. Last week I showed my herbs with frost. Now it’s freezing cold outside in Utah and I will probably have to do my herb photographing in the grocery store. Luckily I am on good terms with my local produce man. I really have no idea what I am going to be writing about this weekend, but hey, that is part of the fun. 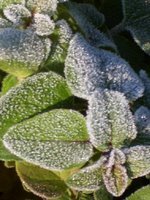 I am guessing that there are at least a few other regular herb bloggers who are also hating winter and wondering what to post about. Of course, we have a lot of people in warmer climates writing about things growing to keep us inspired over the winter. Check back Sunday night for the recap and see what we come up with. DOES MY BLOG LOOK GOOD IN THIS! Does My Blog Look Good In This (DMBLGIT) is a monthly contest to honor the best photograph of food to appear on a food blog in the previous month. There’s no prize except the winner gets lots of nice comments from other food bloggers and the satisfaction of winning. The competition is intense. There are obviously a lot of very talented people writing food blogs around the world. This month I was brazen enough to enter a photo, even though I have only had a digital camera for two months, almost to the day, and I knew I didn’t have a chance to win. I didn’t care, I thought it would be a thrill to see one of my novice photos next to all those great food photos. (It was!) Yesterday the winners were announced, but I don’t want to spoil the fun. Check out the first batch of entries and the second batch of entries and see if you can spot the winner. I was very excited because I did pick the winner! So even if I am a total novice at taking photos, I can tell a good photo when I see it. Now, if you haven’t cheated and read the winners first, go back over and see who the winners were and see if you were able to pick them. Much thanks to Moira of Who Wants Seconds for hosting and to the judges, Anthony, Jeanne, Keiko, Reid, and Sam for their efforts. Lisa, in photography DOF means “depth of field”. I’m not an expert, but that means how the photo shows the difference from the front of the scene to the back of the scene. Depending on different camera settings, you can make it look closer or farther away. Please tell me what “great use of DOF” might mean? Sorry, I forget to change blog id, I often make a mess because of that! Kalyn, I have to skip it this weekend but I promise that I will be back next week! I’ve also invented a new dish today which i will link to my post but i won’t be able to post the recipe until tomorrow (i’m out tonight and am running out of time).